In my flight to New Delhi, I took seat 4K, which is the window seat on the right on the 3rd row. This seat is what they call the “throne” seat, as there was a large table space on both the left and right side of the seat. On my way back, I took seat 2A, which was the window seat on the left of the 2nd row. This seat was right against the window, with a table space on the right side of the seat. The window seats on the left side of the plane alternate between this arrangement and having the table against the window and the seat on the right, next to the aisle. I preferred to have the table on the right as I wanted to have some distance and privacy from the aisle. I also chose to avoid the 2 seats arrangements, as I was traveling alone. 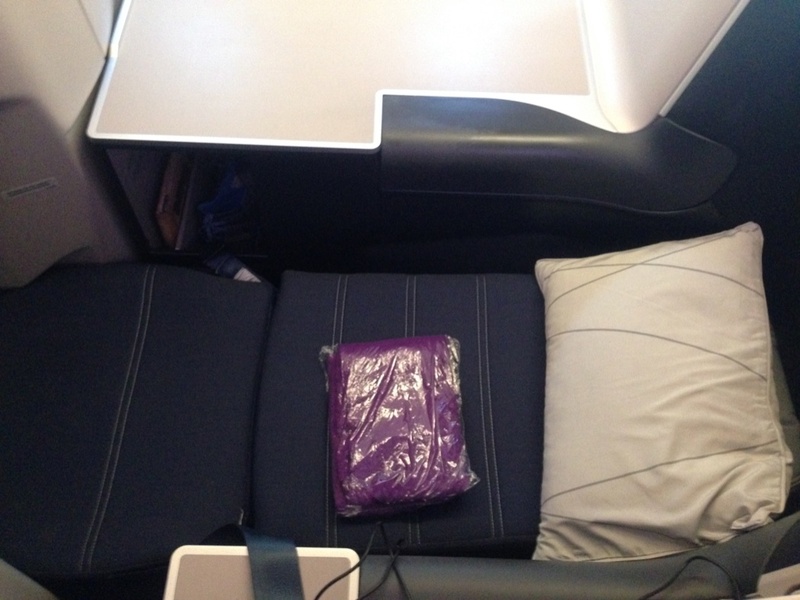 At boarding, the seats had a had a large pillow and a new set of blankets on them. On the side of the seat was a small storage compartment that can be opened up. A small reading light was positioned above the remote control for the entertainment system. At the bottom of the remote was the socket for the earphones, as well as a USB charging point. There was another multi-region power socket on the bottom of the side of the seat for those who need to charge their electronics. 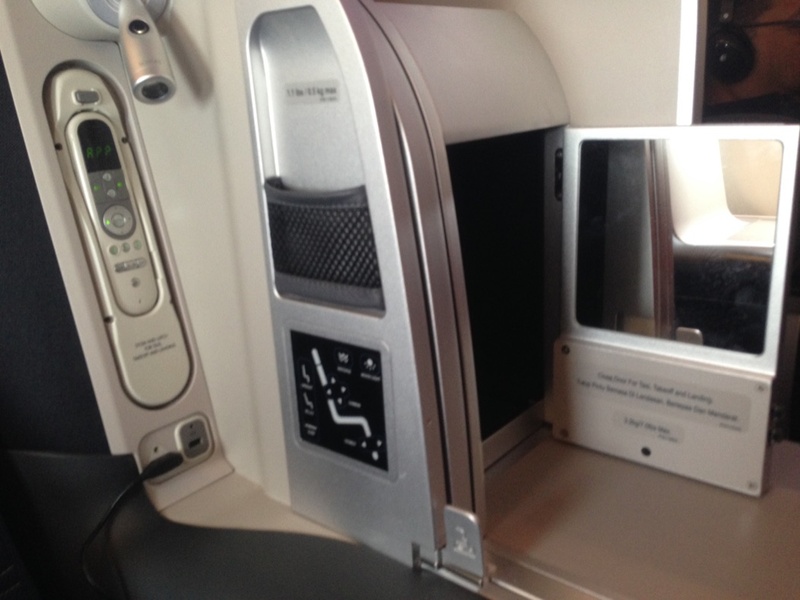 There was also a small pouch for small items such as phones on the side, right above the controls for the seat. Oddly enough, there was another set of controls on the side of the seat, which was placed near the positions where people might put their hands. As such, there was many times where I accidentally brushed on a button or two. In front of the seat was a 16 inch touch screen entertainment system, which had many choices of movies, tv series and music. Underneath the screen was extra leg space, and a small cushion at the end. 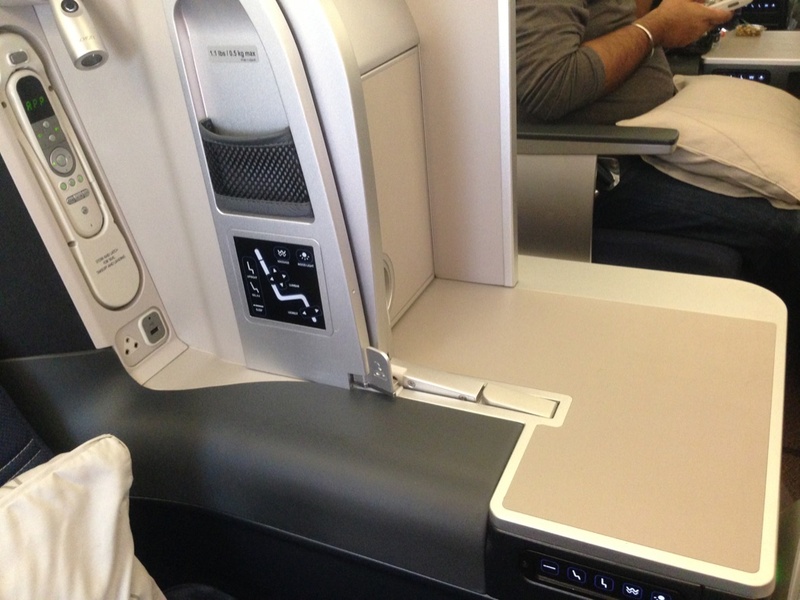 The seat pitch was 44 inches, and when fully reclined, the seat becomes a 76 inches fully flat bed. 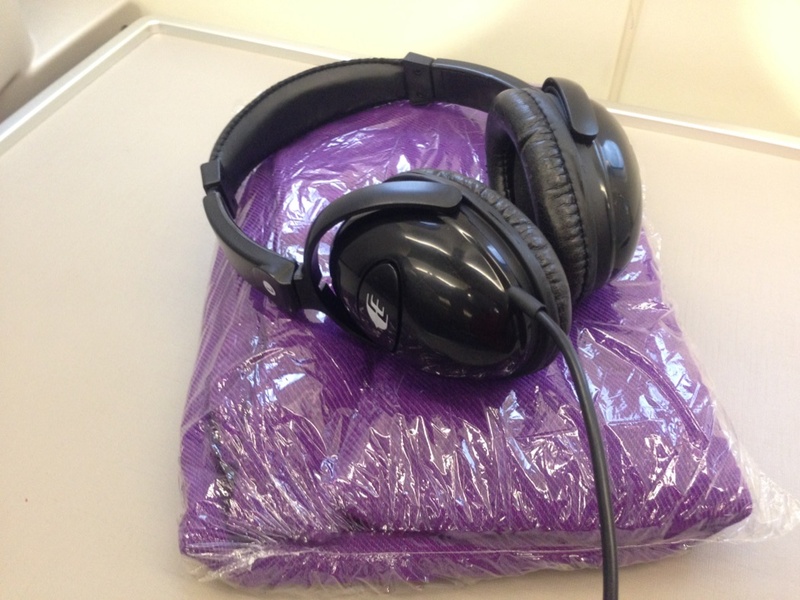 After boarding, we were given the headphone sets and offered non-alcoholic welcome drinks. 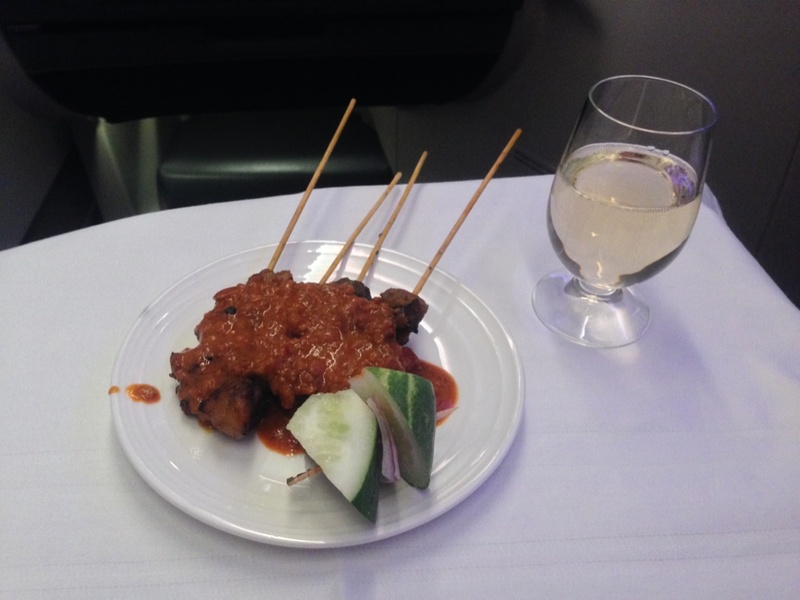 I was told by the stewardess that Malaysia Airlines only serve alcoholic welcome drinks on their London route. As part of their cost cutting campaign, Malaysia Airlines has also cut back on the routes that serve alcohol – generally, flights below 3 to 4 hours will not be served alcohol anymore. Luckily, this flight was more than 4 hours, and there was the option of champagne, a few white wines and red wines as well as other liquor that were offered once we were airborne. 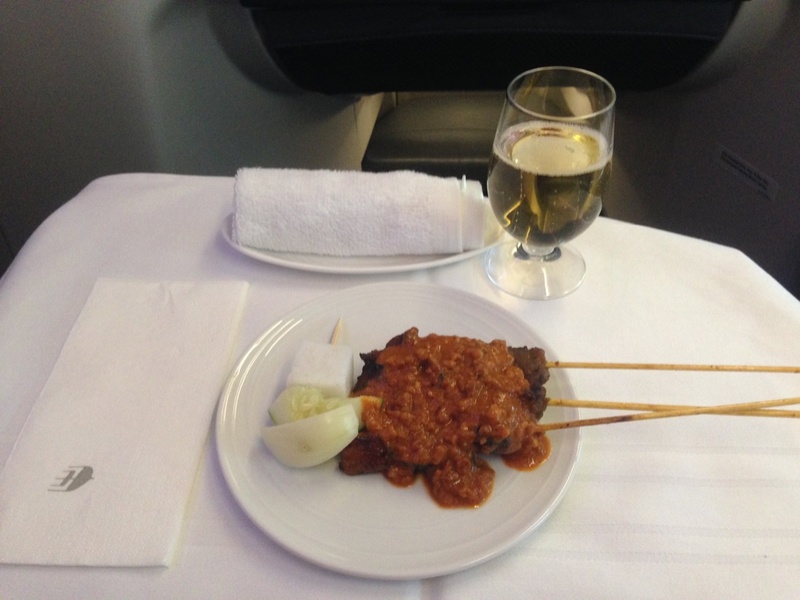 Shortly after taking off, the meal service began with a round of beverages and Malaysia Airlines’ signature dish – satay. I also began watching some TV series while waiting for the meal service to begin. The entertainment option was quite good, as there was a wide selection of movies, TV series and music available. 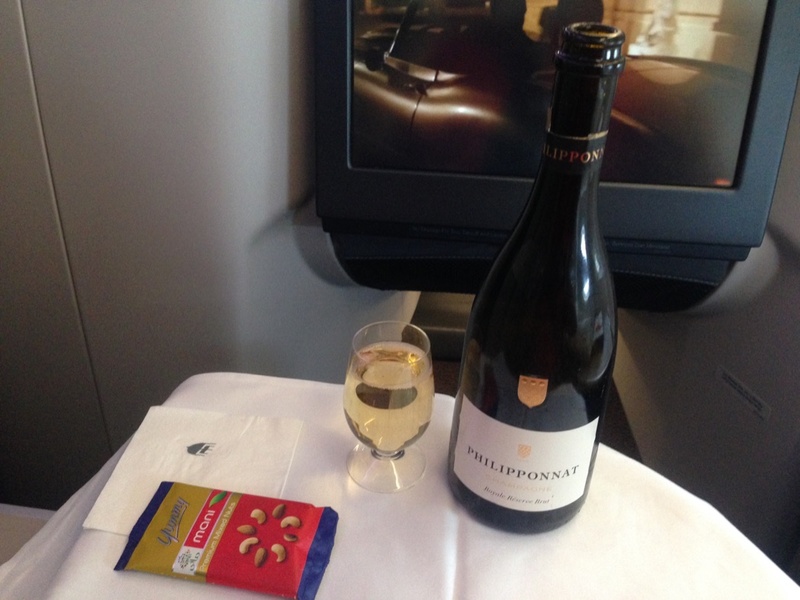 On my trip to New Delhi, I started with a glass of Philloponnat champagne, which was served with mixed nuts and a hot towel. Soon, I was served a tray with the appetizer and dessert. 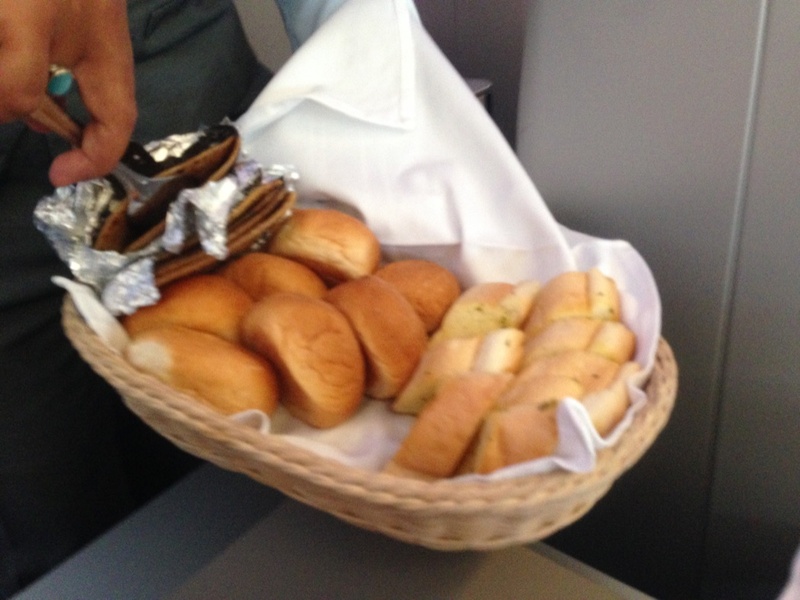 The stewardesses then came around offering various types of bread, before the main dish arrived. 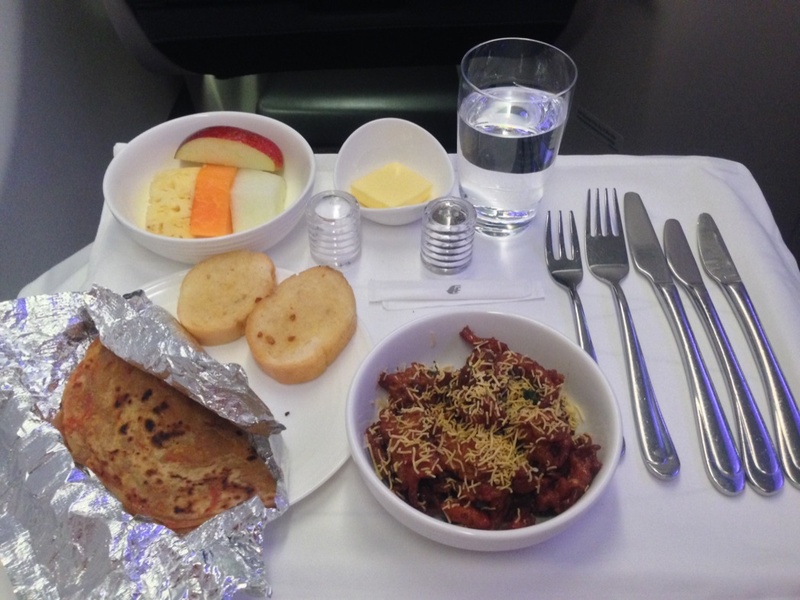 This sequence of serving was also the same when I was flying back to Kuala Lumpur. 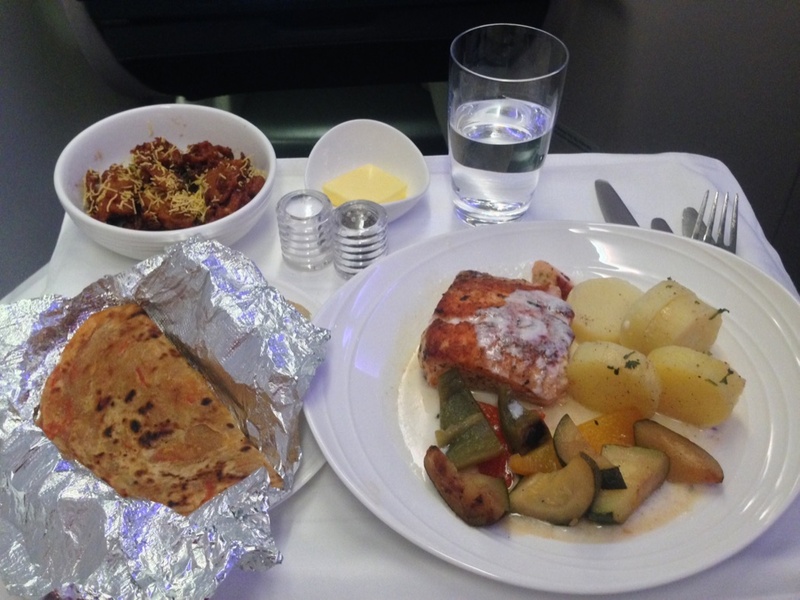 I opted for the chicken on my way to New Delhi, and fish on the trip back. Coffee and Tea were also served after the meal. After clearing the trays and tables, the cabin lights were dimmed, and I began reclining my seat to the flat bed position. 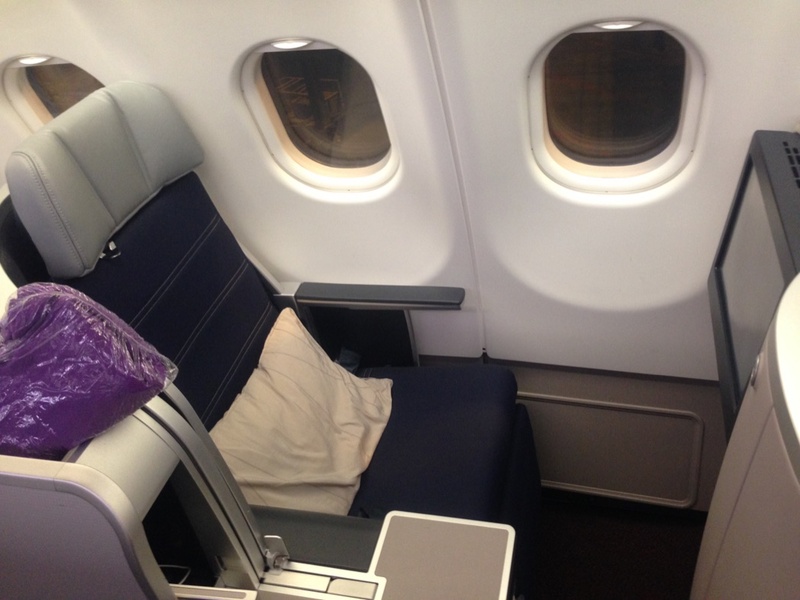 Somehow, despite the new plane, I did not seem to receive the full new business class experience – there was no amenity kit despite this being a 5 hour flight. I was told that amenity kits were only given on flights above 7 hours. Malaysia Airlines did not even stock simple amenities such as an eye masks or toothbrushes for both the trips. Another missing business class element on this flight is the “Chef on Call” option. It seems that only selected routes are eligible, and sadly, New Delhi was not one of them. Despite the advertisement – “It’s ideal for sleep”, there were also no bedding or plush white linens provided, which was contrary to the videos or images shown on all their advertisements. I felt that the leg area when the bed is fully reclined was a bit tight. There was also a light where the leg area is which would turn on when there was some leg movements. This light definitely annoyed me at times. For both my flights, I did manage to catch a little sleep before landing. 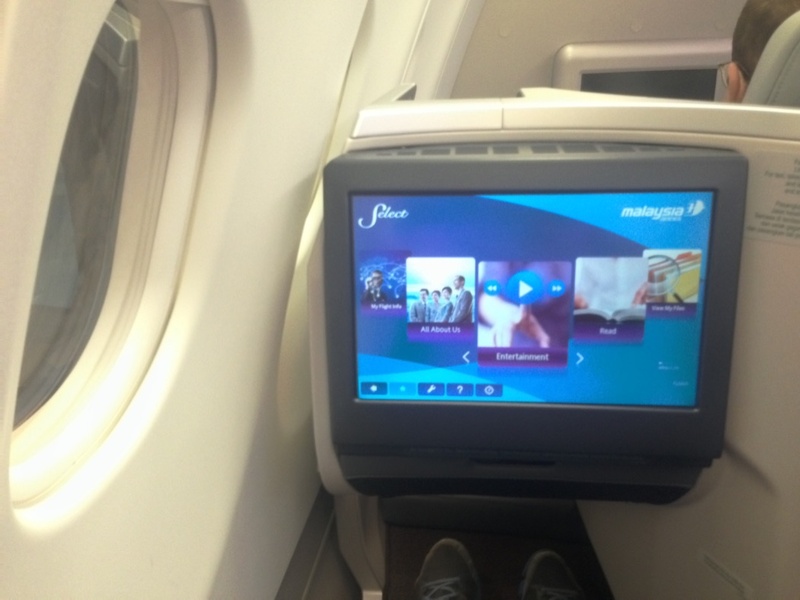 Overall, the new Malaysia Airlines business class is a markedly improvement from their old ones. 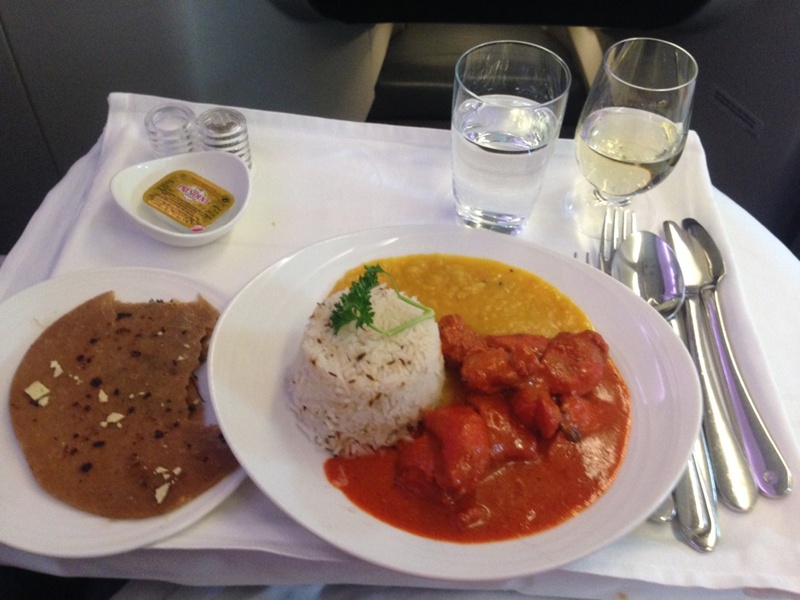 The new seats was solid, the food was tasty, and the service was generally courteous and good. However, I think that Malaysia Airlines definitely needs to streamline their business class experience across the board on their new planes to avoid passengers receiving a subpar experience than what was advertised heavily. 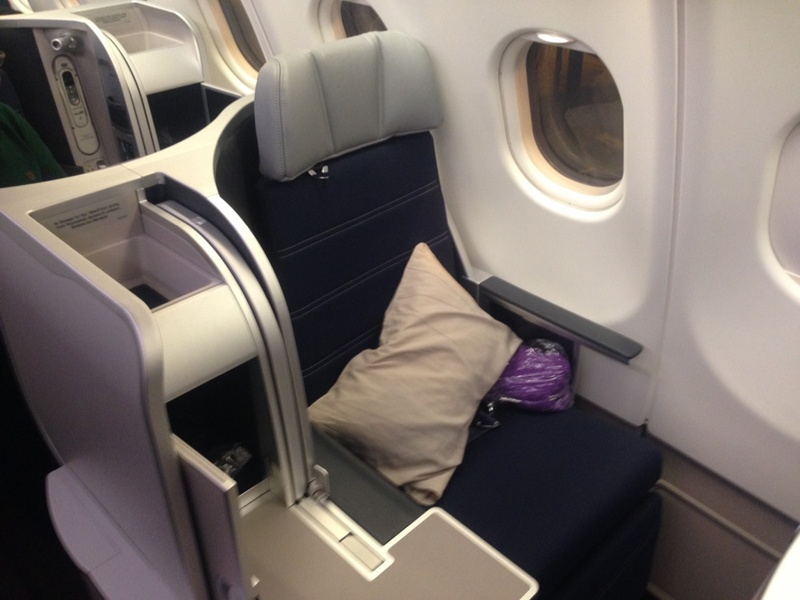 If you enjoyed this review you may be interested in my other airline reviews including my top 10 best business class airlines and the best 10 first and business class airline amenity kits.